Today's New York Times has a very interesting op-ed piece on India's Prime Minister Modi, and the clear lack of education that he and other leaders BJP leaders exhibit. The author, Aatish Taseer, indicts the Indian intelligentsia, to which he and his readers belong, which is associated with Congress party, and generally have received elite Western education, while the majority of the Indian population was left to Socialist-era public education systems that failed to deliver. The parallels to my native Egypt are staggering. Indeed, Nader Bakkar, who may still belong to the Salafist Nour Party, for which he was a spokesman until recently, raised a question in his op-ed yesterday: What have the highly-educated offered beyond criticism of Islamists? At the other extreme, we find democracy advocate Mohamed Aboul-Ghar today saying that he and his party will not deal with prospective parliamentarians from the Nour Party, ostensibly because the party is religious and therefore unconstitutional (never mind that this constitution would not have been possible without the alliance of Salafis with military and civilian-democratic forces to oust the Muslim Brotherhood government). This also reminded me of a vignette with the late Jamal Barzinji, who passed away last month, at IIIT in 2010. He had invited me to a two-day discussion of a proposal for IIIT to sponsor a textbook on "Islamic Economics." Naturally, I stuck with my view that you can't write a respectable textbook on something that doesn't exist, and which is almost certainly neither needed nor possible. My view was that it would make sense to write a book on "Economics for Islamists," as a way to introduce them to modern social scientific thought, which would be of value beyond economics per se. Needless to say, this was not a popular view, especially with the advocates for this proposal, but I believe that it prevailed, at least during that short visit. Late in the second day, Dr. Barzinji spoke to me privately during a coffee break, with apparent embarrassment regarding the Islamist project to which he once belonged, saying that when they were high school and college students, the dominant cultural forces in school were communist, and they sought to balance it out, but found nothing but these anachronistic Islamic references to counter. There, also, the Arab literati and elites are primarily to blame. As the world's largest democracy, India provides a perfect example of the difficulties of balancing democracy, which will put majorities in power, sooner or later, with the need to have decisions made by those who are best educated. The tension becomes particularly high when the latter elites fail to deliver sufficient economic dividends to support some degrees of authoritarian or elitist bargains. They get even worse when the highly educated use their positions of power to make Wall-Street-style fortunes, as their fellow Western-educated friends in the West do, again without producing sufficient dividends for the less fortunate strata in their societies, but demand to remain in control because they know best. Today, I am going to discuss in class (Econ 452: Religion, Ethics, and Economics) the Barro and McCleary (2005, Quarterly Journal of Economics) paper "Which Countries Have State Religion". The preliminary data analysis in the previous few posts is part of my illustration to the students in this class of how to come up with a term paper topic, how to look through available data to formulate a reasonable hypothesis, etc. They all write term papers for this course, and I am writing one with them, hopefully showing them by example how it's done (they also do team projects wherein they do data analysis to replicate results from earlier papers, to learn how to use R, concatenate datasets when needed, use reasonable instrumental variables, etc.). For today, I figured that the presence of a state religion may provide explanatory power for the level of mistrust of people of other nationalities (which, as we have seen in previous posts, correlates strongly with the level of mistrust of people of other religions). 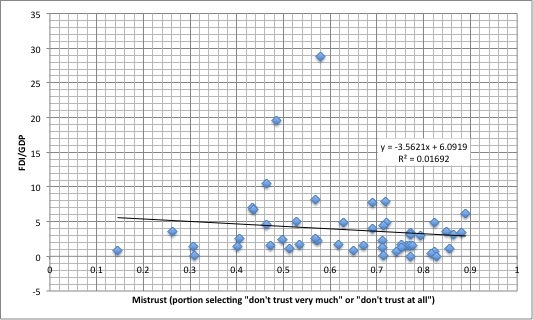 Below are plots of the level of mistrust measured as the percentage of those surveyed who choose "do not trust very much" or "do not trust at all" when asked how much they trust people of other nationalities (this is the percentage for those who gave an answer; i.e. those who said that they didn't know or otherwise didn't give a response wee excluded). The first plot is for the country having a state religion in 2000 against the level of mistrust, and the second plot is the ratio over three years (1900, 1970, and 2000) of having a state religion. The data for that are taken from the Barro and McCleary paper, Table I, which is mostly based on Barrett's World Christian Encyclopedia. 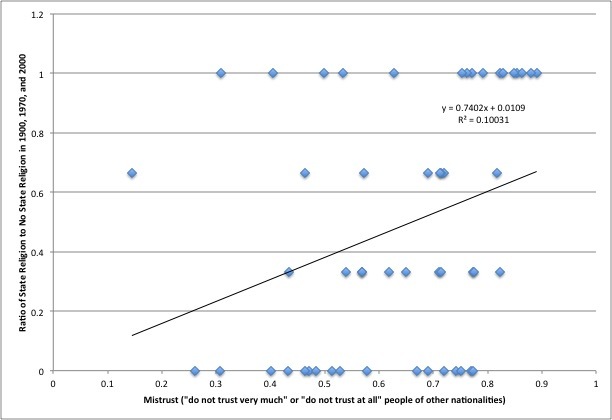 What would be more interesting would be to correlate the state religion variables with the correlation between mistrust of people of other nationalities with mistrust of people of other religions (treating religion as a nationality). I should do that next, but am not sure whether or not I can get it done before going to class in an hour. 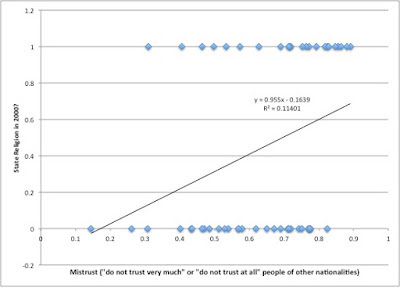 Below are two plots of the level of mistrust in a country (the portion choosing either "don't trust very much" or "don't trust at all" when asked about people of other nationalities, WVS Wave 6 data) against (1) foreign direct investment as a percentage of GDP, and (2) openness (exports + imports) as a percentage of GDP (both from WB, WDI). The two fail to exhibit any significant relationship. (The outlier countries with moderate levels of mistrust and very high levels of FDI/GDP and (X+M)/GDP are the Netherlands and Singapore. Removing them makes the relationship even less significant). I shared the previous two blog posts with an Egyptian-American friend, who was equally alarmed. Then he asked how the patterns in China, Japan, and South Korea compare. Both show very strong cautious mistrust of people of other religions and other nationalities, as well as quite significant extreme mistrust of both. Concentration along the diagonal is extremely high for these countries, suggesting that they have stronger association of nationalities with religions than most other countries. 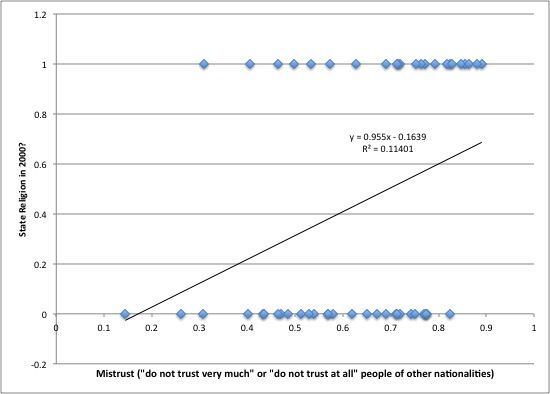 Data for South Korea also shows quite significant cautious mistrust of people of other religions and nationalities, but almost equally significant cautious trust. This places South Korea somewhere between Japan and China, on the one hand, and U.S. and Germany, on the other. Religion, Nationality, and Trust Redux: How Blameworthy Are Muslims? This is really alarming. 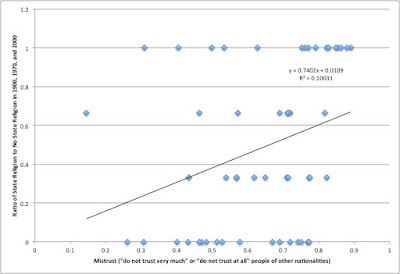 The relationship between trust of people of other religions and trust of people of other nationalities, which I have mentioned in the previous blog posting is one of the strongest relationships in the latest wave of the WVS, may reconfirm my worst fears about Muslims remaining stuck in the 20th Century phenomenon of confusing religion with nationalism. 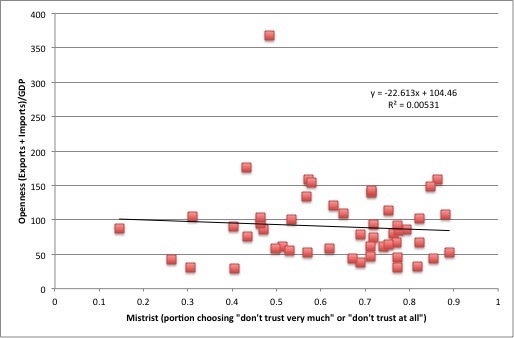 In the previous posting, I showed that for the entire world, the largest category seemed cautiously untrusting both of people of other religions and nationalities, but the second largest category, and not by far, was people who were cautiously trusting of both people of other religions and people of other nationalities. I then showed that the picture was significantly better in the U.S., where a significant majority was cautiously trusting of both. Then it struck me: I had spoken before about the 20th Century confusion in Muslim countries, wherein the concept of a Muslim community ('umma) was interpreted in the sense of nation statehood. The abomination that is ISIS/ISIL may just be the most offensive manifestation of this heresy, but its roots are unmistakably traceable back to the middle century thought of Mawdudi and those whom he inspired, and to some extent also to the earlier effect around the turn of the previous century of Al-Afghani, who equivocated a lot on those issues, depending on his audiences. So, the hypothesis immediately jumped to my mind: Is it possible that Muslims are the most offending culprits in mistrust of other religions and nationalities. WVS data on religious identity is not very usable, because, it appears, that a person, for example, may identify herself or himself as "Sunni", and thus not be counted as "Muslim." So, I decided to look at countries with Muslim majorities, and the first few results were quite alarming. The largest category of those surveyed in Algeria (42%) fully mistrust people of other religions and other nationalities. The second largest category (24%) somewhat mistrust people of other religions and other nationalities. Together, more than two thirds of the population either do not trust at all or somewhat mistrust people of other religions and nationalities. This is very sad, indeed. However, they are still not good at all. 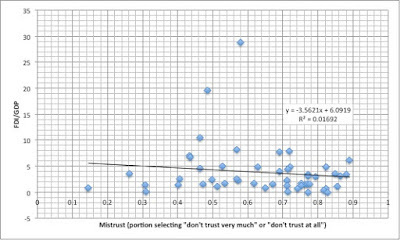 The magnitudes of the two groups along the diagonal of mistrust are not as large as in Algeria, but they are still quite large. 21.5% not at all trusting people of other religions and not at all trusting people of other nationalities is not good! Pakistan is somewhere in between Algeria and Egypt. India displays the most diffuse distribution of any country that I have checked so far, and, certainly, none of the xenophobic mistrust of people of other religions and/or nationalities. I don't want to jump to the conclusion that this is a Muslim problem, but the evidence is certainly mounting in that direction. Now, I understand that these negative attitudes in majority-Muslim countries may be the result of their colonial pasts (this is the same excuse that we use for most ills of that part of the world in the 20th century). However, that cannot be the end of the analysis. This lack of trust must be serving a function in today's world -- which may or may not be a positive one. One can compare it to the negative attitudes towards Islam and towards immigration among some Americans on the extreme political right. However, the latter, thankfully, are a small minority.